Inbound Marketing: Inbound marketing is the act of bringing visitors and leads to your website through content, search engines and social media. Instead of having to go out and get leads (outbound marketing), they come to you. Lead/Demand Generation: Demand generation is a style of marketing that refers to the process of creating demand in a product. This is typically done through content that solves a prospects needs, captures their information, then nurtures them to become a customer. Anonymous Visitor: An anonymous visitor is someone who has visited your site but your marketing automation database does not have an email address to associate with their IP address. Known Visitor: A known visitor is someone who has visited your site with an email address associated to their IP address because they’ve filled out a form or opened/clicked an email you sent them and your marketing automation platform started tracking them. Contacts: Contacts are everyone in your marketing automation database. Each of these contacts will have a different lifecycle stage. Lifecycle Stages: A lifecycle stage is a way to categorize your entire database of contacts based on where they’re at in the sales funnel. The lifecycle stages are often subscriber, lead, MQL, SQL, opportunity and customer. A lifecycle stage should determine how you interact and communicate with each contact. Subscriber: A subscriber is someone who has opted-in to receiving email communication from you, but has yet to fill out a form with more information. Leads/Prospects: Leads are a group of people who are potential customers whose information you have captured via a signup form on your site. Marketing Qualified Lead (MQL): MQLs have shown more interest in your product, so they are more qualified than general leads. You use your own scoring criteria to determine what might make someone an MQL. Oftentimes it’s based on certain pages they’ve viewed on your site, the amount of pages they’ve viewed, number of emails they’ve opened, etc. SQL: SQLs have met specific criteria laid out by your sales team, which makes them worthy of a direct sales follow-up. Opportunity: Opportunities are contacts who have become a real sales opportunity in your customer relationship management (CRM) database. Personas: Personas are one-page guides that explain who your target customer is. Many businesses will have more than one persona. They dig into the demographics of your target customer, what type of person they are and the problems they need to solve. Personas will help you create content that reaches your customer. Buyer’s Journey: A buyer’s journey is the process of looking at the different stages of your customer — awareness, consideration and decision — and thinking through customer behavior, information needs, key search terms and types content that make sense for each stage. Creating a buyer’s journey is important to do before you start creating content to capture leads. Gated Content/Offers: Gated content, often called offers or lead magnets, are generally pieces of content that your leads want to download. This content is often longer and more in-depth than just a blog post, therefore it makes it premium and prospects are willing to give their personal information to download it. Examples of this type of content would be an ‘Ultimate Guide,’ a webinar, a vendor comparison page, etc. Landing Pages: Landing pages are static web pages you can create from within a marketing automation platform without the help of your technology team. They often host a form to download an offer. Conversion Rate: A conversion rate is the percentage of website visitors who actually converted. Landing pages have conversion rates and oftentimes businesses are thinking about how they can optimize for conversion, meaning get more visitors to convert. Conversion Optimization: Conversion optimization is the process of testing and changing landing pages, buttons, CTAs, language, images and more to see if you can raise the conversion rate. Oftentimes even the smallest change, like a button being green instead of blue, can increase a conversion rate. Progressive Profiling: Progressive profiling refers to the process of swapping in new questions on forms once questions have already been answered by leads. For instance, if a lead fills out their name, phone number and email, then the next time they fill out a form, those questions will not be there and will be replaced by new questions. Progressive profiling assures you’re not asking your leads to fill out 20 questions on their first form, which will likely affect conversion. Nurture Campaign/Lead Nurturing/Drip Campaign: All of these terms refer to the same thing: an email campaign that nurtures a prospect to become a customer. Nurture campaigns should be the length of your ‘days to close’ and give your prospect additional content and information to help their decision. Segmentation: Segmentation is the process of separating your contact database based on criteria in their personas and lifecycle stage. You use segmentation to create smart lists. Smart List: A smart list is a dynamic list that automatically adds contacts to it based on criteria you set out. For example, you could want a smart list of blog readers from California. You would create a list that would automatically add anyone from California who has visited your blog. Static List: A static list is a list of contacts that you upload one time, and it doesn’t update automatically after that. For instance, you might have attended a tradeshow and captured leads to download into a CSV. You can upload this list to your marketing automation platform. Static list membership can be part of the criteria you use to build a smart list, however. Workflow/Automated Program: This is the magic to marketing automation. By setting up a workflow or automated program, this is the act of automating your marketing. You can setup an email to trigger when someone fills out a form, visits a page and more. You can automate adding someone to a smart list, or changing their lifecycle stage. You can automate alerting your sales team when someone has become an SQL. Personalization: Personalization or dynamic content refers to the ability to customize what each visitor to your site sees by using their demographic or behavioral data to swap out things like cover images, downloadable guides and more. Days to Close: Days to Close is the timeframe it takes for your contacts to convert from a lead to a customer. Once you have a database of contacts who’ve converted, you can do the math to determine, on average, how many days it took them to become a customer. Lead Source: Lead source is the location or method that your lead came to you. This can be social media, organic search, paid search, etc. For example, if someone clicked on Hatchbuck’s ‘marketing automation platforms’ ad in Google, landed on our marketing automation landing page, and converted to a lead by filling out the landing page form, their lead source would be Googe Adwords. Sales Enablement: This is the process of the marketing team empowering your sales team to interact better with prospects by providing them with critical data and information on your target customers that allow for more meaningful conversations that have a higher likelihood of converting to a sale. CRM Software: CRM software is a database of records and processes to organize conversations and relationships. The most popular CRM is SalesForce, but there are others. Marketing automation platforms usually include their own CRM, or integrate with a CRM already in place. Demographic Data: This is the demographic data for your contacts collected by a marketing automation platform such as company, job title and location. Behavioral Data: This is behavioral data that a marketing automation platform tracks such as emails opened, pages visited and webinars attended. Lead Score/Scoring: Lead scoring is the process of creating a rating system for your leads based on criteria. The lead score is used to identify how qualified a contact is for the sales team. Generally lead scores are built from demographic and behavioral data. 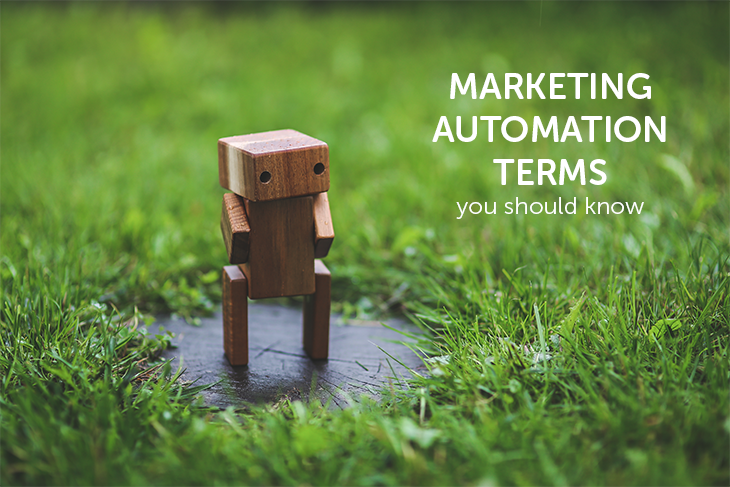 We hope this list gets you a little closer to becoming a marketing automation expert. Did we miss a term that you think we should add, or that you’d like to know? Reach out to us on Twitter @gethatchbuck.